The 1992 Le Mans poster is part of the "The star car used for sponsorship" era in Le Mans posters which lasted from 1981 to 1997. 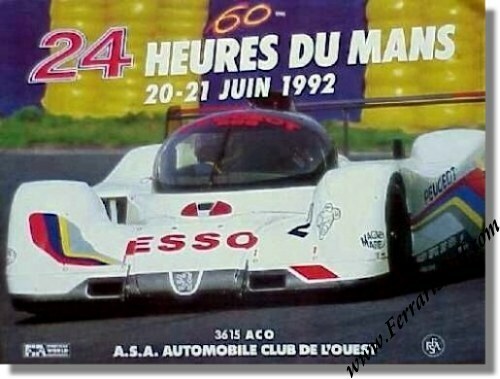 Design of the 1992 Le Mans poster was again in the hands of the S. Conseil agency and is based on a color photograph of a Peugeot 905, the type that won this edition of Les 24 Heures du Mans. The blue and yellow colors of the circuit, that are still being used today, are highlighted in the background.